We rent heaters, air conditioners, fans, patio heaters, tent heaters and portacools, misting fans, power breezers in the Atlanta Georgia area. We rent Tents, Tables, Chairs and party rental equipment in the Atlanta, Georgia area. One stop shop for your party rental needs. Our cooling solutions are in high demand in the months of June, July, August and September. If you are having an important event during those months please do not wait until the last minute to add these items. Everyone else is waiting to the last minute too-- which will probably be too late! We do not have enough systems to cool all of our tents. Your event is too important to be without the proper cooling solutions. This Schaefer VersaMist® Misting Fan with Cart makes it easy to add a refreshing mist of cool comfort wherever it is needed. Rapid mist evaporation lowers air temperatures up to 30 degrees, providing effective cooling indoors or out. The cool air you will now enjoy when using this misting equipment is created through the process of evaporation. Heat is required to change water from a liquid to a gas or "water vapor". Our self-contained power misting equipment creates a "fog" by pumping water at a very low flow rate through small nozzles. When combined with the air added by a fan, this fog is rapidly evaporated. The heat required to evaporate the fog is extracted from the air causing a reduced air temperature. This cooler air is then distributed to people creating a direct cooling effect.. This fan is engineered and designed for use in tents, non-air conditioned facilities, garages, warehouses, and anywhere people and machines need to be kept cool which require general air circulation. Tent pole mounted fans are ideal for tent cooling, heat circulation and detracting bugs. The all-white fans blend in with most tents and are so quiet you will barely hear them, you only feel them. Use one tent fan every 15-20 feet around the perimeter. The Power Breezer® cools 3000 sq. ft. by up to 27°F. It is a rugged and mobile cooling unit engineered to cool outdoors & partially covered areas. Fans, misting fans, portacools--- nothing is more cost efficient and effective! Don't wait until the summer to order a Power Breezer. Your event is too important for your guests to be uncomfortable. When Atlanta gets hot, it becomes HOTLANTA! 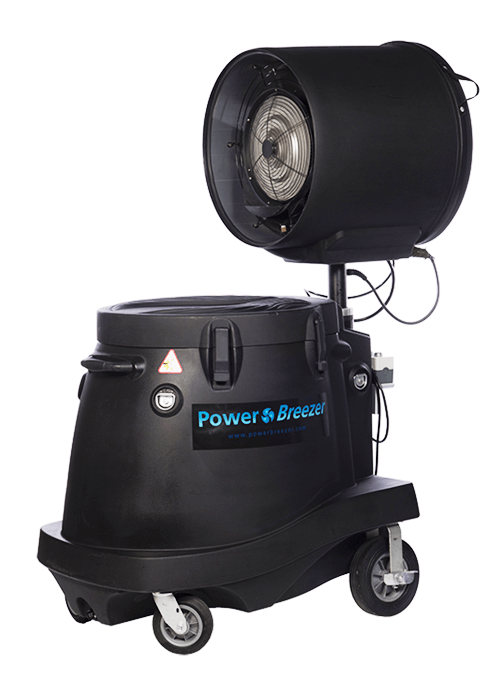 Power Breezers should be ordered well in advance of your event. If you try to order one a week or a few days before your event in the summer it is probably too late. Give us a call though you may be lucky! You and the rest of the area is looking for a way to cool down. Our phones ring off the hook in the summer just for our cooling solutions. Our mushroom heaters are great for patios, decks and open areas. They are not allowed to be used in tents. If you need tent heating solutions our duct heaters are the answer. Please ask your A-1 Rentals Representative for proper guidance on the sizes and amounts of heaters needed. We only rent out our duct heaters for our tents.